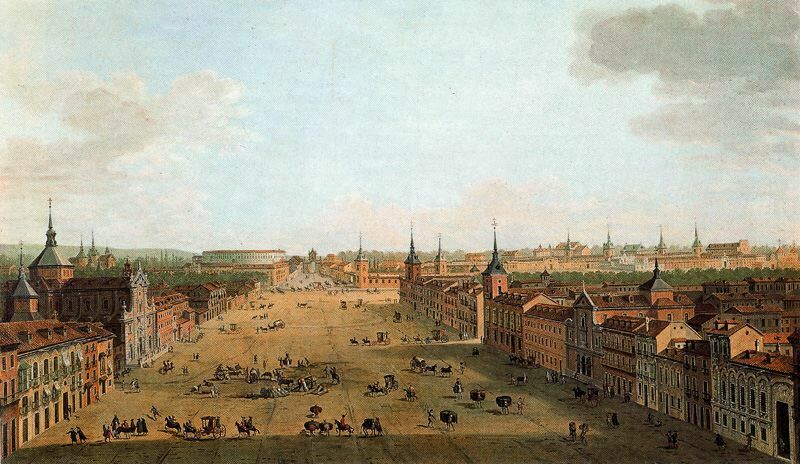 The Metropolitan Area of Buenos Aires, with over 13 million people, is the second largest metropolitan area in the Spanish-speaking world, and, despite the crisis, one of the main economic hubs in Latin America. 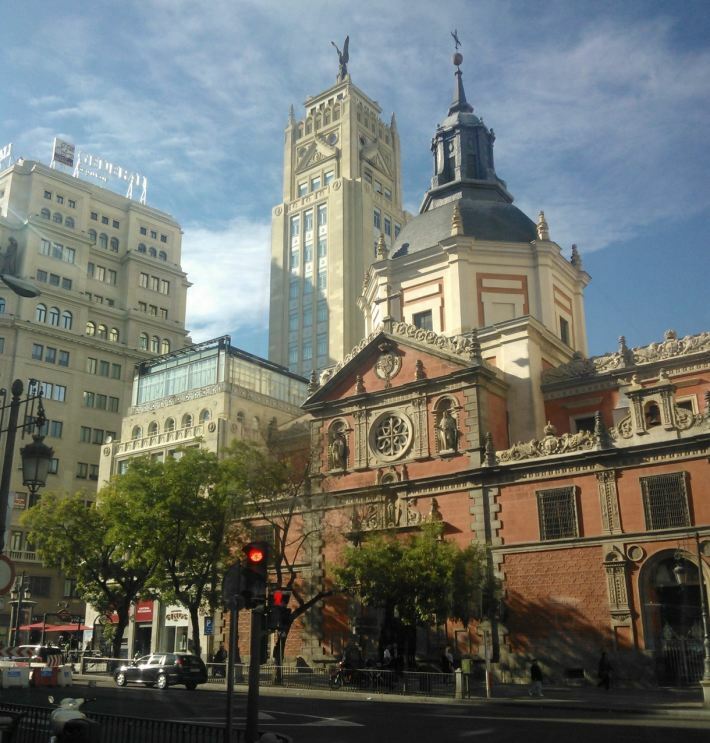 – A lack of structural improvements in public transit system for the last decades. – Recent tender procedures for many projects that fail to materialize. – Low speed for buses. 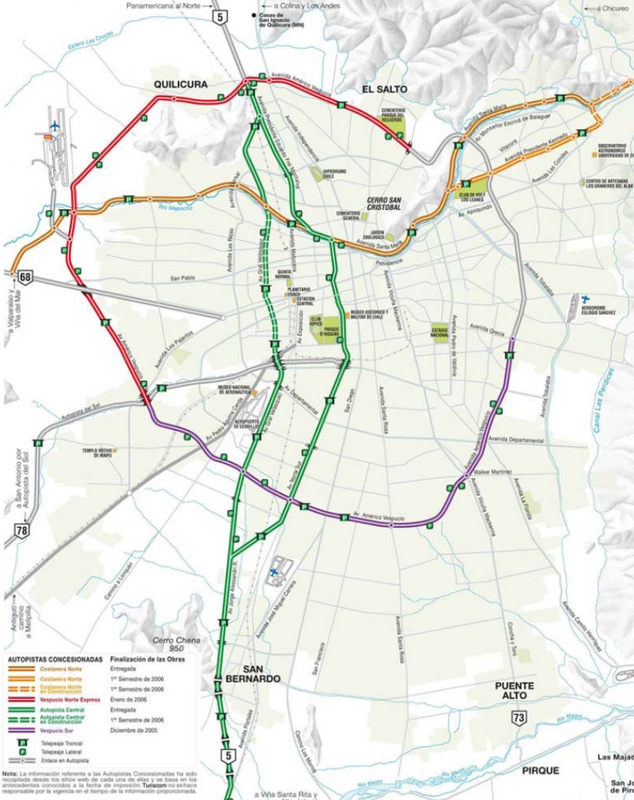 – A failure of the project to create dedicated bus lanes. – Bad state of public transit stations. – Inter administrative cooperation difficulties that prevent a unified planning of the transportation systems. 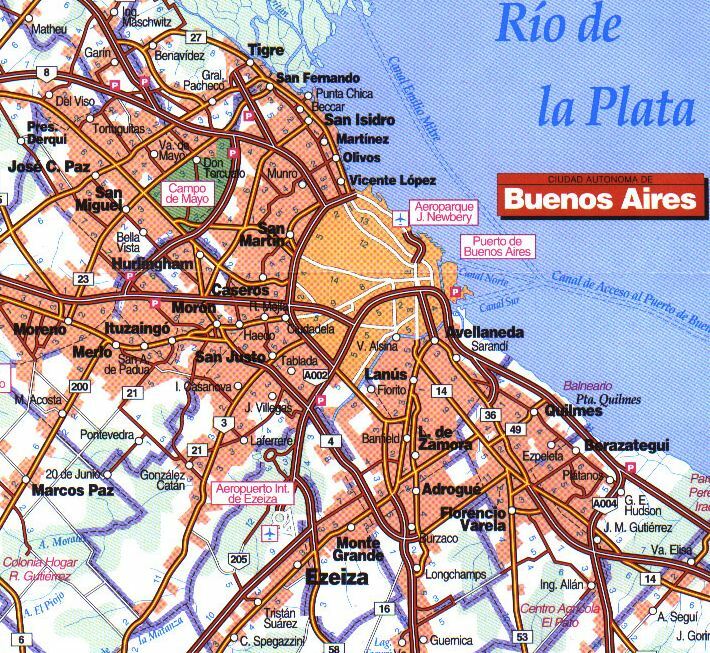 The idea of an urban highway network in Buenos Aires comes from the 1960s, as traffic congestion became a problem. In 1978 a call for proposals to build two toll urban highways was launched. They were opened in 1980 under a concession system, in a complex context with hiperinflation and political unstability (the end of dictature was near). So began a cycle of infrastructure creation that, due to economic hardship, was later passed from a private- public partnership to public ownership. Around 2000, the same history again, with the terrible 2001 crash of the national economy as a problem. The city has today 40 km of urban highways, some under toll systems. THe social and economic dynamics of the country, that has seen its middle classes shrink dramatically in the last 40 years, shows to which extent public mobility policies of any kind require a certain stability to develop, as they depend on long-run credits. Mexico City’s metropolitan area, with slightly over 20 million people, is one of the most populated in the planet. – A spatial segregation between a central area with a mixed income range, a high income area to the west and a low income concentration to the east. 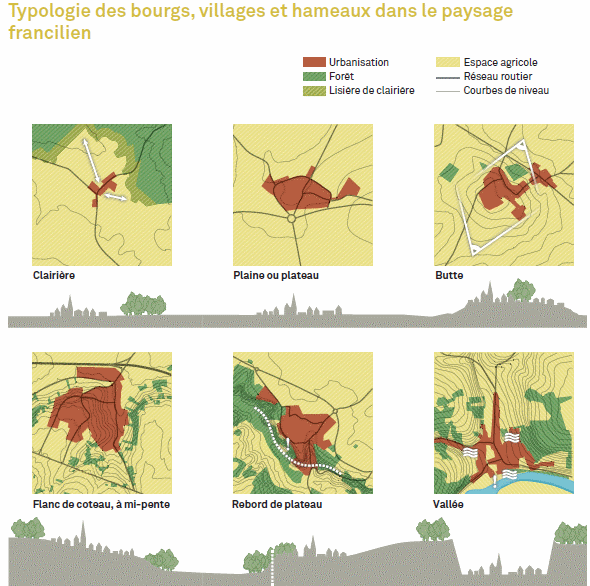 – A decreasing density during the last decades. – Relevant investments in public transit, with a first suburban train line of 27 km from 2008, with low use statistics due to the ticket price and problems at links. – An additional 250.000-300.000 cars hit the streets each year, with an exponential growth in motorbikes. – Substantial quality deficits in public transit systems. Many measures are being planned to try to tackle these problems, mainly on the public transit side. 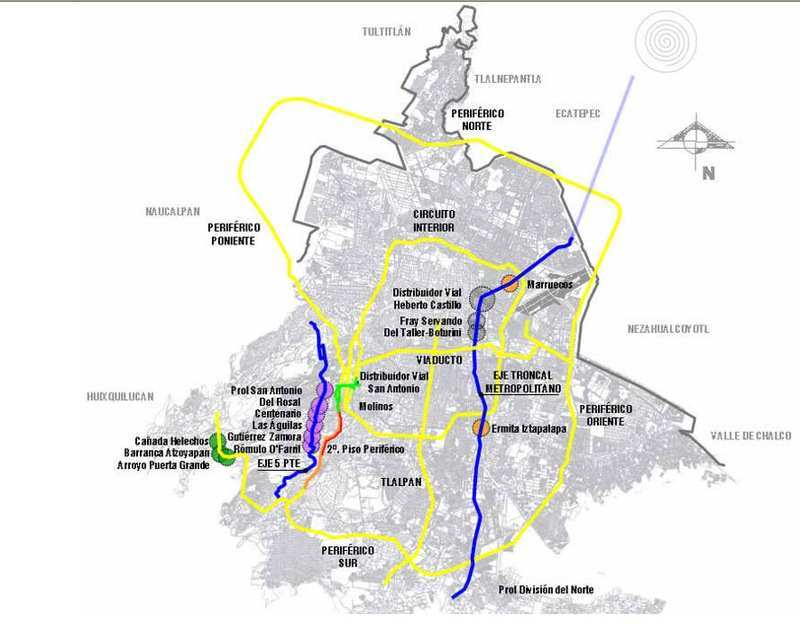 But some measures also involve freeways (according to Mexican government webs, 25% of investments). The Periférico of México is a freeway with an average speed between 6 and 13 km per hour at peak moments. The proposed solution is a second level, using the same land already allocated to the freeway in the 1950s and 1960s. The second level includes a reserved lane for public transportation, and it is estimated that it will increase speeds and reduce lost labor hours and greenhouse gas emissions. The future is hard to predict; official reports insist that the conditions of Mexico differ from those of European and North American cities, but only the future will tell whether the new infrastructure attracts new traffic. The introduction of toll systems for the second floor will probably be the diferential element. 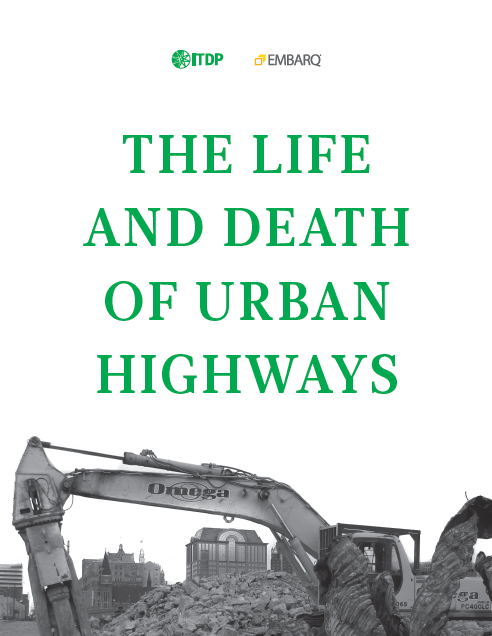 The publication “Life and death of urban freeways” explains the evolution of a concept that many among us find today obsolete. It describes how public policies from the 1940s to the 1960s fueled the flight of the middle class to the suburbs, the role of many administrations aproving infrastructure projects as a solution to that problem, and the problems raised by the hughe economic, social and environmental costs of these urban freeways. The opposition movements, the new approaches to urban problems as those of Jane Jacobs in New York, and the way in which these approaches to mobility, today usually deemed as obsolete in “rich countries”, are applied by “emerging countries” are also analyzed, to finally show the demolition or integracion programmes for urban freeways in Portland, San Francisco, Milwaukee, Seul and Bogotá. I think that what we usually forget and makes us unable to understand what happens in “emerging countries” going full-speed towards a car-dependant society is that the initial stages of car ownership surge in countries are often not subject to congestion, and the feeling of freedom a newly acquired car can bring, especially if there is no efficient public transportation system, is more a qualitative, emotional thing than a rational and quantitative one. The inertia of the images of the “rich countries”, with large freeways and cars, especially in a world dominated by tv, is also to be considered. – The economic growth in the last years, even if as unevenly distributed among citizens as traditionally in many cases, has brought a relevant increase in car ownership. – Investment in urban highways is relevant, altough public transportation is being improved in many cities, and there are success stories as Curitiba in Brazil. – Investments in mobility can contribuite to sustainable development in an effective way only when linked to urban and regional planning as to ensure an efficient system. 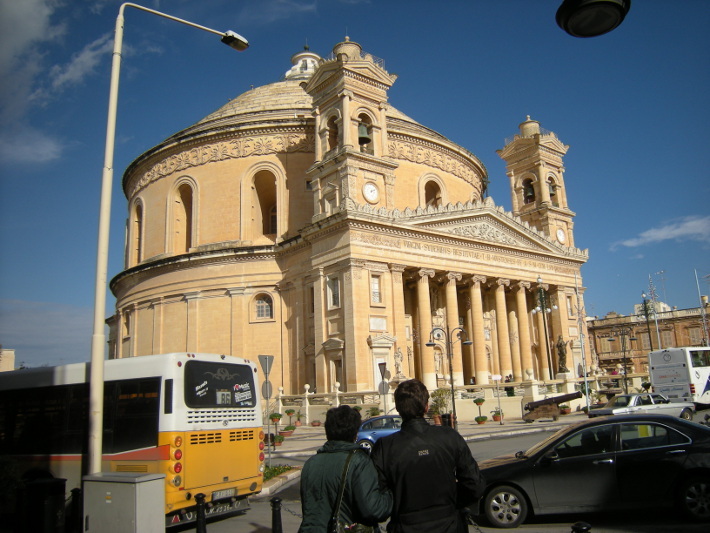 The Assumption Church in Mosta (Malta) is presumed to have the third largest dome in the world, with an internal diameter of 37,2 meters. Built between 1833 and 1860, inspired by the Roman Pantheon, it is an impressive view form the road, in contrast with a more modest and domestic architecture. In the short distance, its isolation in a large void filled with cars makes it less impressive than its original model. The mobility policies are among the “hard” elements in most of the Plan that can be compared to the SDRIF. It is a capital investment issue, that usually drains much of the funds allocated to the new territorial model (not having found a precise financial programme for SDRIF this is still hard to judge here), and the public actors are, at least in Europe, highly implicated. It is also a range of policies with direct impacts on territorial competitivity, but also on environment, due to the impact of linear infrastructure and greenhouse gas emissions. 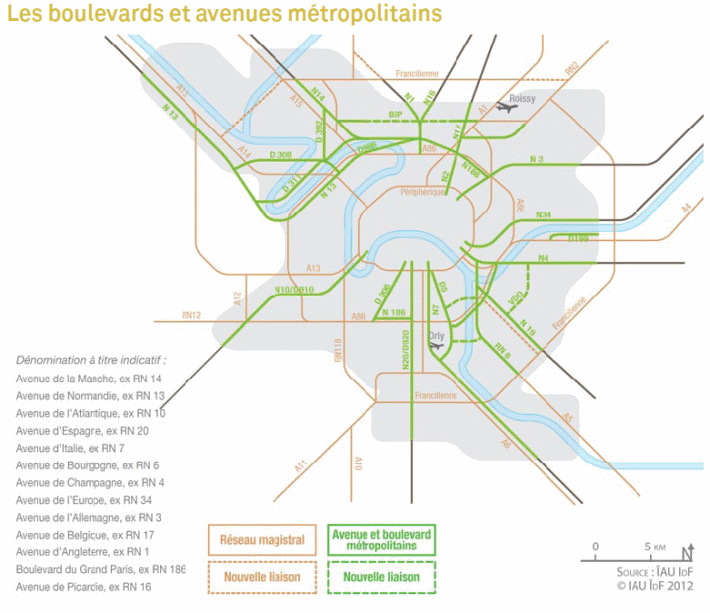 Paul Delouvrier’s Schema Directeur from the 1960s introduced as mobility landmark the RER (regional express network of high frequency trains), as well as a Peripherique inner beltway that was already being built and the radial freeways, as well as the A-86 outter beltway proposal. 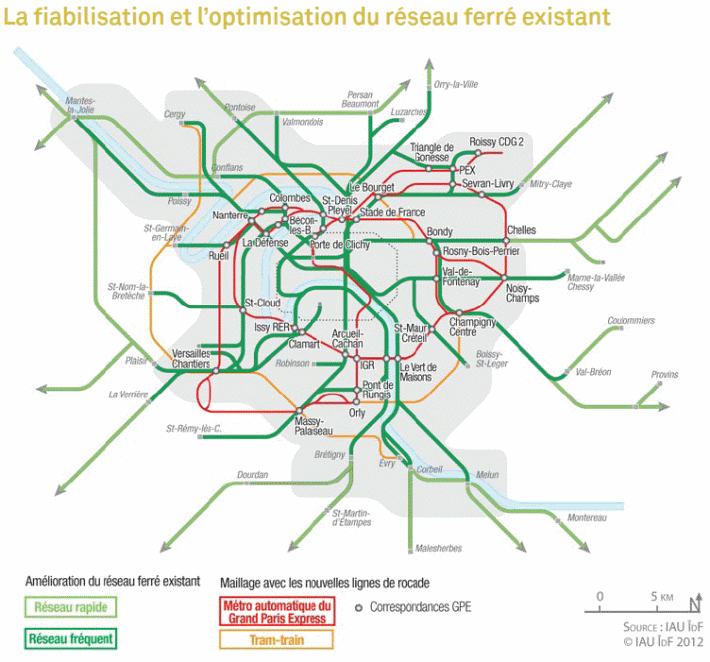 1994’s SDRIF included the Francilienne external beltway and improvements to RER, as well as the idea for a transversal public transit connection between suburbs. 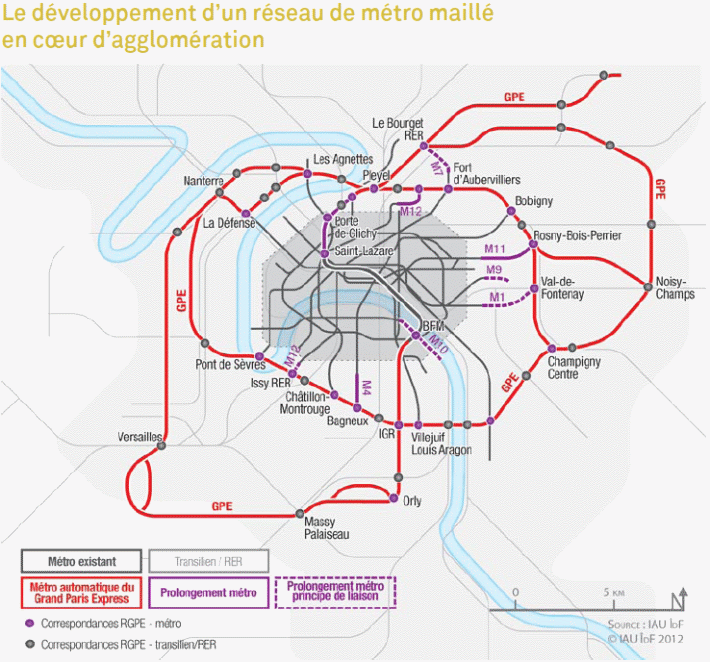 A more defined project for the transversal links between suburbs, mainly on the inner ones, with a 200 km Grand Paris Express automatic subway (today being debated, as the State should decide or not to allocate 1 billion euros to the project). It is the star investment, showing that Grand Paris is not just the theme for an architecture competition, but a defined plan. Drawing a greenbelt can be the starting point for many dissapointments: as most of the time we do not work on a “virgin” territory, the belt will almost never be closed, and its shape will be not that clear at first sight. 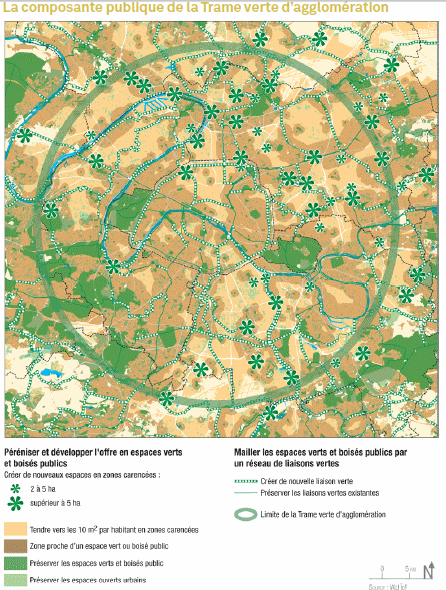 In the SDRIF as often in other parts of the world, there is a Greenbelt project that works with reality; woods around Paris are integrated, as well as regional natural parks, and the debate could be in the conectivity among these spaces. The role of rivers as ecological connectors is also relevant and integrated (even when the Seine banks are sometimes stockage areas for construction materials, it is a truth that nature prevails somehow…). Overall, SDRIF tries to ensure these continuities, in which farmland is also relevant, as much for landscape as for ecologic continuity. 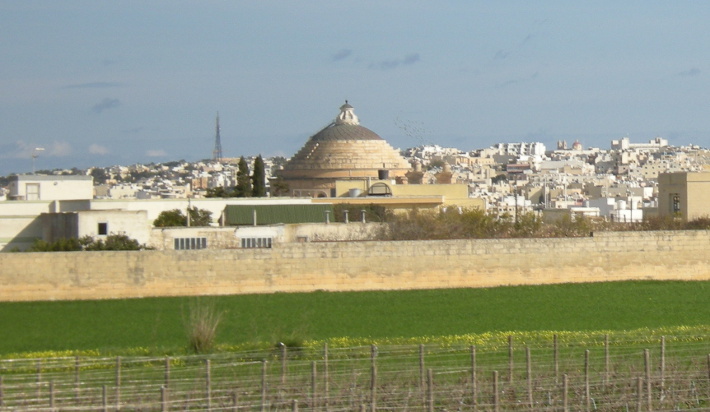 Those open spaces are also used to limit urban growth, and this, combined with the aim to improve the quota of green space per habitant in the denser areas (a complex operation, as sometimes it involves new buildings to ensure a balance between the cost of the new parks and the new revenue), can contribute to improve the quality of life. 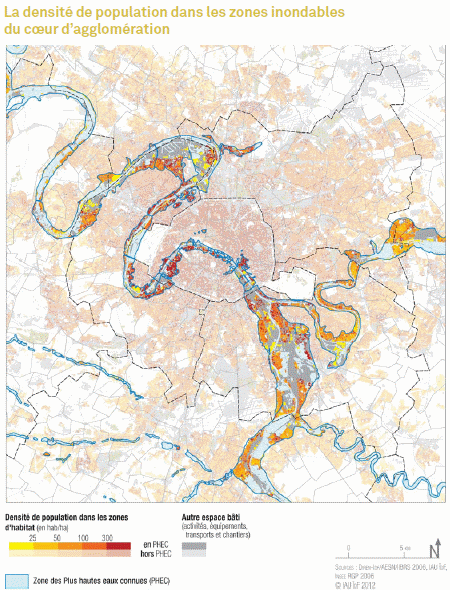 These spaces must also integrate as much as possible flood plains, a relevant issue in a metropolitan area with large rivers. 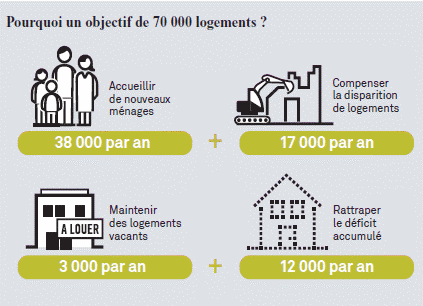 38.000 units per year to adress the needs resulting from demographic growth, taking into acount a growth at the same speed as the overall french population taking into acount ageing population, residential behaviour and migrations. 12.000 units per year to avoid a deeper deficit than today. This would allow a reduction in the household size as in the rest of the country, making easier for people to change their homes according to their needs. 3.000 units to maintain a vacancy rate similar to the present one, alredy the lowest in 40 years. Overall, this building effort will compensate a regular decline in the housing production since the begining of the 1990s. It should allow to develop the offer of housing for students, old people, handicapped people, young workers, people in social risk, and nomads. Social housing would be developped to adress the current deficit. Most of this process will correspond to private developers, depending so on the social and economic situation, and especially the acces to credit by both developer and citizens, the real purchasing power of households and the evolution of real estate prices. Roissy- Charles de Gaulle airport, north of central Paris, is one of the main economic assets of the metropolitan area, and it is one of the project territories of the SDRIF 2012. Well linked to the metropolitan core and northern areas, it is less well connected to the west and east. 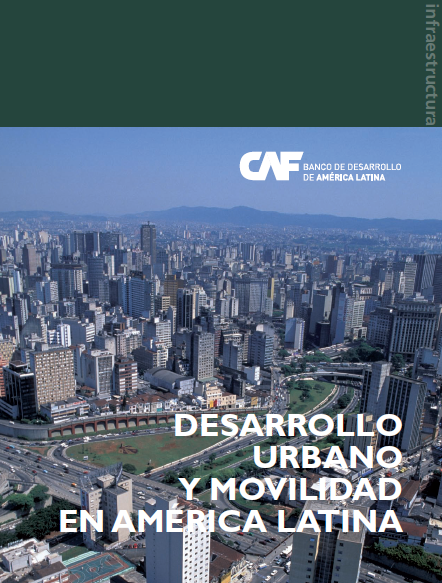 The regional scale challenges are to find a balance between economic and residential development, to tackle the differences between a powerful economic scene and the social weaknesses, and to avoid a capacity overflow in roads. Accesibility will be improved by high speed trains for the long haul travel, and by improvements in regional trains to be reinforced by the automatic subway “Grand Paris Express”. The noise plan for the airport limits land use locations. Improvements in employment beyond logistics and associated activities are a major goal, looking for a more diverse and qualified activity system. Maintaining the large open spaces continuities north of the airport, as well for farming as for woods and natural systems, is also a major goal, as there is already a fragmented space due to transportation elements and urban elements. To the north and east of the airport there should be an increased density and a development of public services in existing fillages. Le Mesnil- Amelot will have a Grand Paris Express station making it the gate to the metropolitan network for northern Ile de France and Picardie, and this will allow for an urban extension of the village. 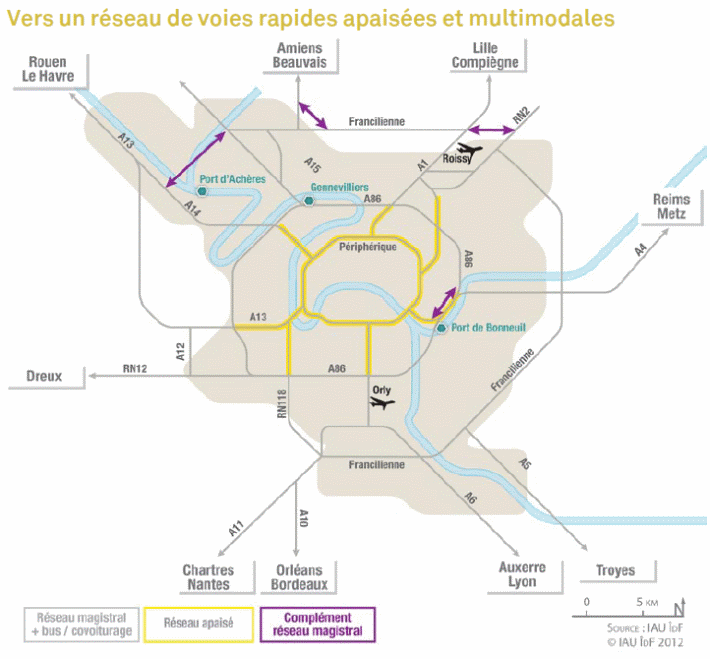 To the west and south of the airport there is already a good accesibility by public transport, that will be improved, and many large metropolitan public facilities as the Exhibitions Park of Villepinte and the Sausset Park. The trend to locate large public facilities will be fostered. 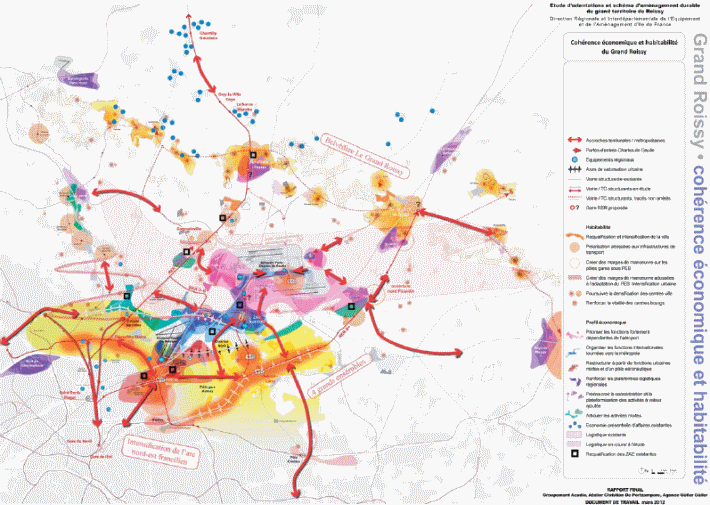 The Gonesse Triangle will be a strategic element due to its location halfway between Paris and the airport, and its economic and social developement needs in Val de France. 300 hectares at most should be urbanised, provided that they get public transit, and they will be limited by a regional project to preserve 400 hectares of farm land north of the triangle to ensure they are not fragmented.